Card-making-magic, Issue #026-- Indian summer! Summer is coming to a close and before you know it the clocks will go back and the nights will be drawing in again. Not quite summer and yet not the time for heavier clothes either. A really good Indian Summer is what we could do with in the UK ... just to get us ready to face the winter. Imagine a September with some lovely hot days to just laze around in. Still time to enjoy a BBQ in the garden before the cold of winter evenings again. But perhaps in your part of the world you still have to have your summer and if that is the case then I hope you will have a good one. Coming up next month is another wonderful "Great Northern Papercrafts Extravaganza" (GNPE) in Harogate and I will be there spending my pennies as usual. The last one was in March and I spent a small fortune. I have to own up to coveting the Spellbinders Grand Calibur die cutting machine. 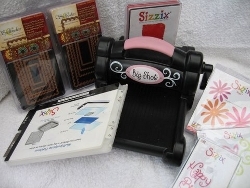 I have the Big Shot and I have no problems at all with that machine but I use a lot of Spellbinders and so it seems logical to me to buy the machine. And of course it will take the Grand Nestabilities that I bought from the last GNPE. Well that's my reasoning and I am sticking to it!!! 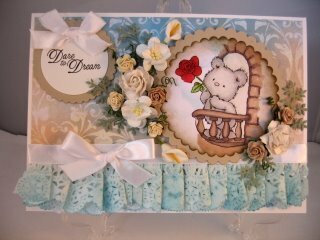 As you progress with your cardmaking then you to may decide to buy a Die cutting machine. There are many on the market and your choice is personal to you and your budget. But in my opinion it is one piece of equipment that you will probably want to buy fairly quickly. It will cut many shapes and patterns for you with a turn of the handle and all these elements can then be added to your cards. Another one you may want to consider is a Scoring Board. This will give your cards a professional finish whenever you want to make a fold. There are many different projects that can be done, from popout cards to boxes and much more. Again it is a matter of personal choice and what suits your budget. The two featured on the website are just my choices. 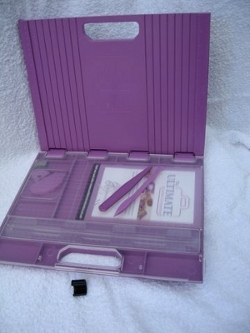 You may decide on another brand but they will certainly enhance your cardmaking skills. Paper Lace is one of the new additions to the website and I am sure you will enjoy the simplicity of it. It uses up any paper doyleys that you may have in your cupboards and the effects is so pretty. Paper Punched Lace is another way to add the lacy look to your cards and this one makes use of any punches that you have in your "stash"
Both are far cheaper alternatives to the real thing. 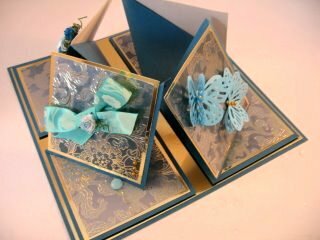 The Quad Easel Card is a new fold added for you to try and it makes a realy stunning centre piece. I hope you have been to look at your own additions, and told your friends to see them on the automatic feed to Facebook. This gets updated on a daily basis and it will show all the cards that visitors send in as they come around. Please click the "Like" button if you visit it for the first time. As always my thanks to those of you who have taken the time to send in your photos. The Gallery is now growing to such an extent that there are over 300 submissions that feature many beautiful cards. Thanks also for your lovely emails ... it is always a pleasure to chat with you through these letters.